Looking for net send command in Windows Vista? Too bad! This command is longer available in Windows Vista, however you can use msg command as replacement to send short message to other users or computers. Please note msg is not supported in Windows Vista Home edition. There is no specific service (such as messenger) you need to run in Vista, you can use msg immediately. 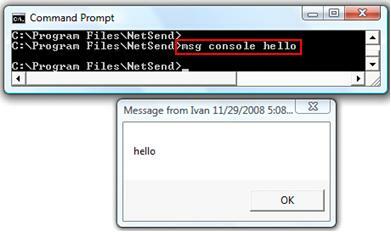 For instance, you can just type msg console hello in command prompt to send message to yourself. To send message to other users who is logging on the same computer or server, you can type msg [username] [message], example: msg nicola Hello! Let’s go! Here is simple command syntax to send message to other computer. It will work if you send message to other computers in same Windows domain, however it didn’t work when I tried to send message to other computers in same Windows workgroup (you can try and see whether it works). msg /server:david console Hello! David how are you? Return to top of "Msg - Net Send Command in Windows Vista"! !